The story of Fraoch (pronounced Frooch ... with a soft 'ch' like 'loch') comes from the Scottish Gaelic tradition, though it looks back to the same heroic age as the Irish cycles of Oisin, Cuchullain, and so on. As with the Irish stories, Queen Maev is the villain. I've tried to keep the language simple ... the opportunities are plentiful to take the story in new directions by using deliberately anachronistic language, as Christopher Logue does with his Iliad rendering. Likewise, there is plenty of scope for innuendo, but that lies close enough to the surface to need no emphasis; better to leave it as it is, I think, and let the sexuality simply be; although that is, of course, impossible. 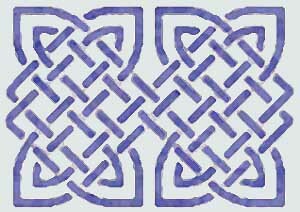 The knotwork mage is adapted from a design by Reed Mihaloew. his proud man like a hurt girl. of Fraoch, son of Idad, the golden one. It's him that gave the cairn its name. whose sword and fire were well-proved. her mother with armies to command. the only man she wanted was Fraoch. At last the pair can lie side by side. all she wanted was him in her bed. his `honour' only made Maev crazy. and why she destroyed that gracious man. a crop of ripe fruit on the tree. you'd look for neither food nor drink. any sickness or the worst wound. guarded the rowan tree's good fruit. fell ill, she said, some woman's thing. replied, and asked how he might help. and bring the fruit to her himself. `I never gathered fruit before'. and swam across the peat-dark loch. its head laid up against the tree. without the serpent waking up. and brought it back to Maev's room. his honour and his life at stake. He looked at her and made his choice. He turned and went back to the lake. and woke the serpent from its sleep. its jaw closed on his arm, they fought. but, ach, he'd laid his sword aside. and, as the beast rolled, it tore the limb off. the stones were running with their blood. fainted and fell at the lakeside. the loch has got the name, Loch Maev. will it be known, while I still live. and laid the man in his castle of stone. who had no son to carry it on. who held his ground at any threat. Lovely his mouth, the welcome it gave. Lovely his mouth that women kissed. just for the smile on Fraoch's face. his hair was dark, was raven-black. and whiter than snow was Fraoch's skin. teeth as white as meadowsweet. there was no finer man than Fraoch. and broader than a ship's timber. has left me nothing but my grief.